The schedule and topics are coming together for the Orlando Ennes Workshop in Walt Disney World® on October 5. Confirmed topics include Here Comes Ethernet® with Steve Lampen from Belden. This session will shed light on how IEEE, which owns the Ethernet standard, has been working on a re-write of the Ethernet standard called 802.1BA AVB, and the AVB is for audio and video bridging. Brad Plant from Ross Video will discuss audio watermarking for audience measurement, followed by the Engineer’s Guide to the process of automating control of news productions and explains the many benefits for adopting automated production control technology in your facility. Dave Brender at the Copper Development Association will talk about the elements of a building’s wiring and grounding systems (including lightning protection) that pertain to power quality at communications facilities and improve up-time. His presentation sites actual experiences at broadcast facilities where grounding and lightning protection were of paramount importance in maintaining system availability. Tony Peterle presents a tutorial on SNMP, which includes an explanation of how SNMP works – the structure and types of SNMP messages, how they are transported over the network, and how they can be used to monitor and control remote equipment. He will also explore in-depth SNMP communications with at least two different target devices – one a well-known transmitter line, and at least one other device from outside the broadcast world (SNMP is found in many devices such as UPS systems, HVAC systems, IT systems, etc). 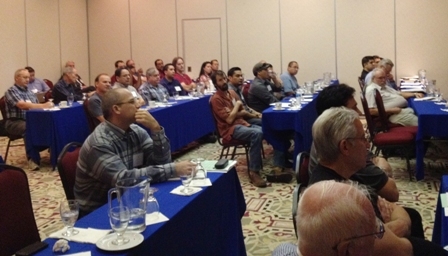 Norbert Miles, who attended the El Paso Ennes Workshop, said, ” The Ennes Workshop plays a very important part and key element and tool for keeping up with today’s technological advances in the broadcasting industry.” Well said!